If you need help or support with T-RIP please send email to support@tbiznetwork.com with details about the problems or issues. You can also call us between the hours of 8:30am to 5:00pm Mountain Standard Time. (Note – in Arizona we don't change our clocks for daylight savings so in the summer we are the same time as Pacific Time.) Keep in mind that we have a limited staff and you may have to leave a message. Email is always a quicker way to get support and our email is monitored even after business hours and on weekends. Send email to support@tbiznetwork.com. Support for full versions of T-RIP is free to the original purchaser of the program for six months from the purchase date. Support for upgrade versions of T-RIP is for three months from the purchase date. After that time support is charged at the rate of $75 per incident or $200 per year for a support contract. If "support" is simply a setting issue or setup issue then it is normally a free call. If there is a technical problem that is often caused by Windows updates or changing computers then there will be a support call charge if the issue is out of the warranty/support period. Before calling for support, please make sure you have read the manual and checked the Troubleshooting steps at the bottom of this page to see if there are any updates, new support videos and additional help. Support is only given for the program T-RIP and not for your inkjet printer. Although we will try to help with inkjet printer problems, we would prefer you contact the dealer you purchased the printer from or Epson direct. It is often easier to answer support questions via email. Send email to support@tbiznetwork.com with details about your problem. Make sure to include your contact information, phone, computer system, graphics program printing from, etc. We will try to phone you back if we need more information or need to walk you through troubleshooting problems. There is also a built in online viewing program called Team Viewer where with your password and permission we can log onto your computer and troubleshoot problems. Make sure to also download the UPDATED 66-page manual. It has much more detail about how to use the program. T-RIP 2.0 works on Windows 7, 8, 8.1 and 10. If you have FastRIP, T-RIP 1.0 or 1.2 and you upgrade to Windows 10 you will need to upgrade to T-RIP 2.0 HERE. If you have T-RIP 2.0 and need to do a reinstall you can download it HERE. If you have T-RIP 1.2 and need to do a reinstall you can download it HERE. You may be asked for your PIN number again. If you do not have it send email to support@tbiznetwork.com asking for your PIN. Please include all of your company details, date of purchase, etc. Microsoft is now forcing some users to update to Windows 10 from Windows 8/8.1 – without permission. This means if you have T-RIP 1.0 or 1.2 that you will have to upgrade to T-RIP 2.0 – OR – reverse the upgrade. Click HERE for more details about how to revert back to Windows 7 or Windows 8 if you have upgraded to Windows 10. IMPORTANT WINDOWS 10 RECENT UPDATE PROBLEMS CAUSING "DONGLE NOT FOUND" ERRORS. Windows 10 has had many recent automatic upgrades and we have had reports from some users that when they open T-RIP 2.0 they get a "dongle not found" error (T-RIP has a dongle option). For some reason Windows is changing the "Machine ID" of the computer which causes problems with our security program and other software that uses the Machine ID. The "easy" fix is to uninstall T-RIP 2.0 and do a fresh install using a new download of the latest Free Trial which has been upgraded to allow for these Windows 10 changes. The "fixed" version of T-RIP (build 3.51) was put online for download October 28, 2017 but it will help even with more current 2018 updates of Windows. You may be asked for your PIN number again. You can get the Free Trial from www.T-BizNetwork.com/downloads/. If you have made changes to T-RIP for your specific printer model take a screen capture of the Printer Options window at Queue/Properties/Print Mode Overrides. for reference when you do a reinstall. This is a Windows/Microsoft induced problem. We have released a 34 minute video about T-RIP that covers features, installation and troubleshooting. At around 27:00 minutes there is a short troubleshooting section. This video was created using T-RIP 1.2 but it works the same for the newer T-RIP 2.0. Should you Upgrade from T-RIP 1.2 to 2.0? This is a common question and the answer is no. If you have T-RIP 1.2 and it is working fine then there is no reason to upgrade unless you upgrade to Windows 10. T-RIP 2.0 has some new features for new users like an Ink Density Wizard, a couple of Windows 8.1 installer fixes, compatibility with Windows 10, and other minor changes – but other than that it very similar to 1.2 and the price has increased. If you have version 1.2 build 5.08 and you need to install it on a newer computer you can download that version as long as you have a PIN number to unlock it. If you need to re-download 1.2 send email to support@tbiznetwork.com with your company details and we will send you a link. T-RIP is very trouble free and easy to use. But, due to the wide range of printer models and computer operating systems there can occasionally be communication issues between the printer and T-RIP. Here are the three most common errors or problems and suggestions on how to fix them. The most common error you can get when printing to T-RIP is a “holding” error. This can happen when you release a job to print (right clicking on “pending”) and the job will start to go Active and may even say Printing and then it goes to Holding. You can “clear” this error with a right mouse click and try again. Holding errors are almost always communication issues and fixes are covered below. 2. Job starts to print and then stops part way through. T-RIP will start to print a job and may show 5% or more and then simply stop. 3. “Unable to Start Queue” error or similar “can’t open” error. All three of the above errors usually mean there is a communication issue between the printer and T-RIP. It is not uncommon for you to be able to print directly to a printer using the Epson driver – but not be able to print to T-RIP. Typically this means you have not yet "installed" the T-RIP printer driver or selected the correct port. See Troubleshooting Suggestions #3 below. 4. Printer prints half pages or has ghost images. This a common "problem" with the Epson 1430. It is not really a problem but more of a quirk. The Epson 1430 (US version only) has an Ink Status Monitor that can stop the communication to the printer. It must be turned off. See Troubleshooting Tip #7 below. 1. T-RIP 2.0 tries to print jobs as CMYK. A recent bug was found that causes T-RIP 2.0 to print any black and white files as CMYK files. You can print the files but you have to select the Black file and ignore the CMY files. This problem happens if you install T-Seps 2.0 and ignore the Ink Density Wizard which automatically sets the Print Modes to print files as black only. We have fixed this problem but you have to download a new "Printer Package" from our website. In T-RIP 2.0 go to Devices/Manage Devices. Looks for a small Globe icon – fourth from the left – Check for Online Updates. Click on this. If there are updates for your Printer Package (it will check for all the printer models you have installed) you will get a message at the bottom of the screen to click on Update Devices – sixth icon from the left. You should then close and re-start T-RIP and the problem will be fixed. Click on the screen capture on the right to enlarge it. If the above change does not fix the problem, go to Queue/Manage Queue and delete the current Queue for the printer. Then do a fresh install of the same print driver. When you get to the Ink Density Wizard screen do NOT cancel this. Simple click on Done. This refreshes the driver with the most current version. The older FastRIP and T-RIP 1.0 and 1.2 used Print Modes to control the ink density and most of these Print Modes had selections like 1440×720 SD or DD or TD (Standard Density, Double Density, Triple Density). In T-RIP 2.0 this method is being replaced on certain newer printer models with just resolution settings in the Print Modes. You now have to use the Ink Density Wizard Queue/Ink Density Test Page to determine the correct ink density settings for your brand of film and your brand of ink. Please read and try these suggestions before calling for support. These suggestions are listed in the order of effectiveness from the easiest and most likely to fix an error to fixes that are not always as obvious. 1. Make sure your printer will print using the Epson driver. This at least rules out a general communication or cable issue. 2. Make sure your printer is turned on and there are no lights flashing. On most inkjet printers, flashing lights mean either a job is being sent (and maybe hung up), paper or film is jammed in the printer, or the printer is out of a particular ink color. If a color is entirely empty the printer will not print. Some older model printers like the Epson 3000 will not print or will print stretched images if the ink levels are low. 3. The most common “fix” for communication issues is to “refresh” the printer driver. This one is easy. Go to Queue/Manage Queues. Select your “queue/printer” from the list. Scroll over to the right and click on Remove. Your computer may ask for you to approve this. Next, in the same screen, click on Install. You have just refreshed the printer driver. If you have installed a new printer driver or possibly removed the main Epson driver for your printer you will need to perform this step. MAKE SURE THE PORT SETTING IS SET FOR AN EPSON PORT. The port must NOT be set to "NULL" (nothing) and the button to the right must say "remove" after you have clicked on "install." This make the T-RIP driver that you see when in your application like Corel, Draw, AI or Photoshop. Click on the image on the right for a larger view. 4. Check overall communication between T-RIP and your printer. Go to Devices/Manage Devices. Select your printer. Click on the fourth icon from the left which is a small printer “Device Properties.” If there is good communication this button will show you ink levels and maintenance options for your printer. If you get an error “unable to communicate….” then it is obvious that T-RIP is not talking to your printer. Refer back to suggestion #2. Are there lights flashing on your printer? Is it out of paper/film? Is it low on ink? 5. Sometimes the Epson driver (not the T-RIP driver) needs to be removed and re-installed. You might have noticed that with all inkjet printers you can often end up with a number of duplicate drivers. This is one of the issues when you turn off a computer and re-start it. Epson will often sense the printer is online and install a “new” driver – even though the older driver is already installed. Go to the Start button in Windows and then to Printers and Faxe s or Printers and Devices. If you see multiple versions of the same driver (copy 1, copy 2, etc.) delete all but one of them and then re-start T-RIP. You may have to go back to suggestion #3 and do a “Remove/Install” to refresh the communication between T-RIP and the driver. One almost fail safe method is to delete all the Epson drivers for your printer – other than the new Epson T-RIP driver. Unplug the USB cable from your printer for a few seconds and then plug it back in (the printer should be turned ON). Windows will install a new fresh driver. Got back to Step #3 and do a new Remove/Install. 6. The Windows operating system can also have quirks. When you go to Queue/Manage Queues you need to make sure the printer is set to the correct port. This is often Epson…..USB2 or something similar. It is pretty obvious which port is correct. But, for an odd reason and something that is not consistent – Windows will change the port setting to something like Unknown USB port. This most often happens when you shut everything down at night and in the morning turn things back on. As a reminder – if you do this – always turn on the printer FIRST and then the computer. If you are having communication issues between T-RIP and your printer, check the port setting in Queue/Manage Queues to see if it is still on the Epson port. A newer problem has developed with the latest Epson model printers like the 1430 where it prints only half a page and has ghosting on the print.Epson USA put in an ink drop monitor (US version only) that interrupts T-RIP during printing. If you have problems with pages not printing all the way you need to turn this feature OFF in the main Epson 1430 driver/Preferences window. The fix is to simply turn off the Epson Status Monitor. Got to your Epson driver either through your graphic program – click on Preferences – or go to your Start button in Windows and then Devices and Printers (Printers and Faxes in some Windows). Find the Epson driver (not the T-RIP version) and right click on it. Click on Printing Preferences and then click the Maintenance tab. Click the Speed & Progress button. Check Disable Epson Status Monitor. Go to the Start button in Windows and then Printers and Faxes or Devicesand Printers (depending on your version of Windows). This page shows all of the printers and devices you have hooked up to your computer. 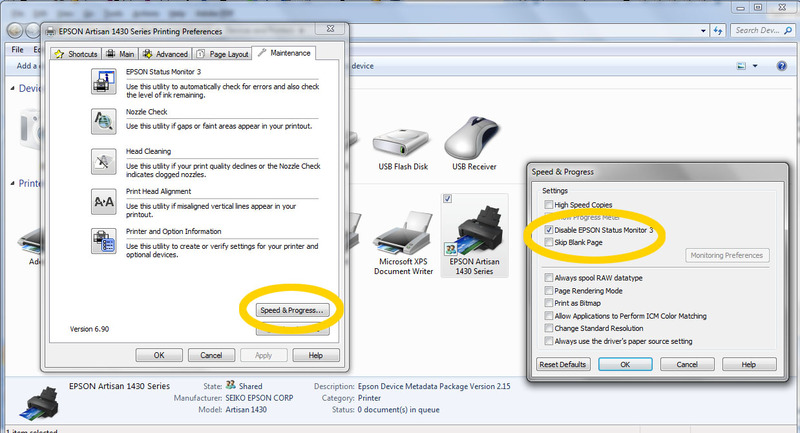 Select the Epson driver for your printer. Do not confuse this with your new “T-RIP” driver. 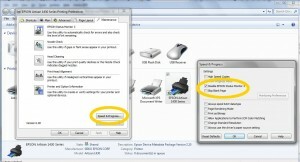 Right click on the Epson printer icon and select Printer Properties. Select the Ports tab. You should see the current printer port and it will be something like USB003 or USB002. Change the Port selection to Print To File. This MAY effect the ability to print in color with this printer using the Epson driver. This is an Epson error that causes the problem and not a T-RIP error. Go to Queue/Properties. If you DO NOT have all of the following selections – go to Tools/Options and check Show Advanced Settings and Options. Select Print Mode Overrides and Printer Options. Check the upper left box Change default printer options. Change Color Plane to Multiple Black. Change Resolution to Big Dot 1440×720. Change all six colors to #2 (dot size) and 15% for each color. Click on the graphics on the right to see a larger images. 8. Film size and type mismatches can cause errors. If you are using a printer that supports sheet and roll media and if you can control the type of media from the printer menu – make sure you have the same settings in Queue/Properties/Media Setup. You don’t want that menu to be set for sheet media and the printer to be set for roll media. 9. Cable issues can cause errors. Older Epson printers like the 3000 and 1520 have a dated parallel port output connection. There are a number of third party parallel-to-USB cables on the market but some are not good. It may take unplugging and plugging back in these cables a number of times to get good communication.And, with some older printers and cables being a little fussy, if you have a USB hub with lots of connections this can cause communication issues. If you are using a USB hub try plugging the printer directly into the computer to see if it fixes errors. 11. Some Epson wider format printers like the 7000 and 9000 series offer the option to print with either dye or pigment ink. The Print Modes in T-RIP are specific to dye or pigment ink for this Epson printer series. If you are using a Print Mode that is for Dye ink with a printer that is set to print with Pigment ink – you may get a “command error” at the actual printer. 12. You can create Custom Page Sizes inside T-RIP to accommodate specific non-standard film sizes. These custom sizes will often not show up as an option in your applications like Corel Draw or Adobe Illustrator. To fix this go to Devices/Manage Print Media. Select Update Control Panel Now. Close this window. Now all the custom page sizes will show up in your graphics software. 13. A file will sometimes simply not print out as a separation but will print in color as a composite of all channels. This can happen if you have your application (Photoshop, Corel, Illustrator) set to print a composite rather than a separation. You can have this same problem if you have not chosen a Print Mode (Queue/Properties/General) and have left the Print Mode set to Default. 14. Certain printers (especially older models) will put down too much ink. The first thing to check is that you are using the correct side of the film. The sticky side (wet finger test) is the printing side. Make sure you have selected Standard Density or an SD Print Mode. 15. Can’t Import Job…..” “Can’t place job on page….” errors. See if you have a print command hung up in the standard Windows Print Manager. This can happen when printing to your inkjet printer not using T-RIP and then cancelling a print job. It is like putting a kink in a hose. There is a job hung up and it needs to be cancelled from Windows Print Manager. A job might be hung up in T-RIP. If you cancel a job or have errors on a job it might get hung up. Try shutting down T-RIP and re-starting it. If that doesn’t help, go to Queue/Manage Queues and Remove and then Install the Queue to refresh it. 16. Rather than waste film troubleshooting printing errors, once you have made changes, try printing a Test Page first. The real test to see if everything is communicating correctly is to either print a Test Page, or go to Devices/Manage Devices – select your printer and click on the small printer icon (Device Properties). If you get the error that T-RIP is unable to communicate with your device then you know that your films won’t print. 17. WHEN ALL ELSE FAILS….Shut Everything Down (you might try this FIRST). Certain devices and computers like to see things turned on in a specific order. Generally, you should turn the printer ON before you boot your computer. When all else fails there is nothing like starting fresh. TURN EVERYTHING OFF AND UNPLUG EVERYTHING FROM THE WALL OUTLET (computer and printer). Computers and printers still receive current when they are shut off. Unplugging them removes any current from reaching them and will often clear out any “bugs” that need to be shut down. Wait two minutes and then turn the printer ON and re-start your computer and T-RIP. If you are printing to other devices that use a dongle, or if you have another RIP installed for other applications, there may be dongle conflicts (if using the dongle version). Try removing other dongles, or disabling other RIPs before printing to see if it resolves conflicts. Occasionally you simply need to try a fresh install. Before re-installing T-RIP you should uninstall it first. Go to the Start button and then Control Panel. Click on Programs and Features. Find T-RIP and uninstall it. There is much more information about T-RIP in the Help system built into the program. 90% of the time the clear horizontal lines are caused by clogged Nozzles in the printer. This will happen over time and quicker because we are using film transparencies. Film transparencies show head problems much more than paper does. The ink will bleed slightly on paper and cover up banding. Film is much less forgiving. This causes clear lines to show more quickly. Try the following steps to see if you can get rid of the clear lines. 1. Run head cleanings 4-5 times. 2. Print a Nozzle Check from the Regular Epson driver on film. Look to see if there are any breaks in the black. If there are then run about 3-4 Head cleanings on the black. If not continue to step 3. 3. Create a small, solid black box in a graphic program. Print this box through T-RIP on film. If you still get clear horizontal lines run about 3-4 more Head cleanings. 4. Print out the black box again through T-RIP on film. If the clear lines improve, try running more Head cleanings. Print the Black box again. See if the clear lines are going away. If they are going away, then try running more Head cleanings. If the clear lines stay the same when the second black box is printed, then the Nozzles are clogged with dust/debris/dry ink. You need to have your printer professionally cleaned by an Authorized Epson Repair Service. They will need to fix the Nozzle/Head on the printer. They may be able to clean the Nozzle or they might need to replace the Head. When they replace the Head, it replaces the Nozzles on the printer. If you do not know of anyone close to you, contact Epson Support. They can help you find someone close that is an Authorized Epson Repair Center. The Epson Support number is 562-276-7202. The Epson small desktop printers are great for film output. The only real problem is that like most small inkjet printers, they don’t always like to print on film. They are designed for paper. Your best solution is to put only ONE sheet of film in the printer at a time. This is especially important if using waterproof film which can stick to itself and have a lot of static. Also, the paper holders for some of the smaller Epson printers are not very good at holding large 13” x 19” sheets in place. You may have to actually place your hand on the film as it starts to feed to keep it straight in the print path. You can also tape a small cardboard “guide” at the top of the paper feed holder to keep the film straight when being fed into the printer. These printers will also sometimes advance the film through without making a print. They have sensors that don’t always like clear film. If that happens simply place the film back in the paper feeder and if necessary press the small “paper” icon (top button) on the printer. The Epson 1400 and 1430 use dye based ink which is great for film. Most Epson model printers use pigment ink which is better for full color longevity but is not as good on film. Dye based ink works best and you can use the standard Epson dye based ink on film. You can also buy third party dye ink and film from a variety of industry screen printing suppliers and if you print a lot of films you should look at getting a bulk ink system for your printer. With a bulk ink system you can put cleaning fluid in all the color slots so you won’t have to keep buying the colors. Support for T-RIP is free to the original purchaser for one year from the date of purchase. Before calling for support, please make sure you have read th manual and checked the online support page to see if there are any updates, new support videos and additional help. Support is only given for the program T-RIP and not for your inkjet printer. Although we will try to help with inkjet printer problems, we would prefer you contact the dealer you purchased the printer from or Epson direct. We do not offer free support for other programs like FastRIP, FilmMaker, Photoshop, etc. Support for these programs (technical support) is available for a small fee. It is often easier to answer support questions via email. Send email to support@tbiznetwork.com with details about your problem. Make sure to include your contact information, phone, computer system, graphics program printing from, etc. We will try to phone you back if we need more information or need to walk you through troubleshooting problems. Note: Arizona does not observe daylight savings and is the same as Pacific Time Zone USA in the summer months. We know that when you aren’t printing films you aren’t printing jobs and we try to give the best support in the industry. Like many companies – we work long hours so if you are calling after our normal support hours there is a chance you will get someone to help. Also, if you get voice mail after hours, leave a message and we will get back with you as soon as possible. T-RIP is a Windows only program. It works on Windows XP (must have service pack 3 installed), Vista and Windows 7. It has been reported to work under Windows emulation on a Mac but technical support is not provided for that environment. If you have Windows XP and are working from a Trial download, make sure you downloaded the XP version of the Trial (it has additional files over the Vista and Windows 7 version).